Everyday, we experience just a fraction of the world, but a lot goes on outside our immediate day-to-day surroundings. Giving in to your inner wanderlust doesn’t have to mean working hard for multiple years in order to save enough money for a long vacation. And you don’t have to schedule a gap year and worry about losing your clearance while you see the world. Working abroad takes some planning to make it happen, but it can provide experiences that can stretch you beyond your comfort zone and even strengthen your resume. Of course, it’s not as simple as just applying for a job. You will have to put in some upfront work and be willing to work through the Visa system. It is possible that an overseas position will simply fall into your lap, but it’s way more likely that you’re going to have to take the road less traveled to finding the right overseas job. Research countries that would be an ideal fit. For those of you who happen to super flexible, you might be able to skip this step. But chances are, we all have our tipping point on what we can take in our surroundings. So, take a second to consider what you prefer in job environment, life environment, pace, urban versus rural life, etc. If you’re going to move somewhere and be the outsider, you want to do your homework ahead of time. Understand the economic, cultural and political aspects of each country you are considering. Life is different around the world. Start your networking. This is perhaps a no-brainer because networking is helpful for any job search. But in searching overseas, you are the outsider, so knowing someone on the inside – whether it’s inside a company or inside a country – can greatly increase your chances of changing your address. Insight or tips from overseas colleagues or friends can boost your search. Look for worldwide companies. It might be easier to start in the U.S. with companies like Raytheon, Booz Allen Hamilton or SAIC (to name a few) and either apply directly for positions like this intelligence analyst position or start in a U.S. office and try to transfer to an overseas location. This option could take longer to pan out; however, it could be less of a headache to make the move when your employer is handling the Visa process and footing the transfer bill. 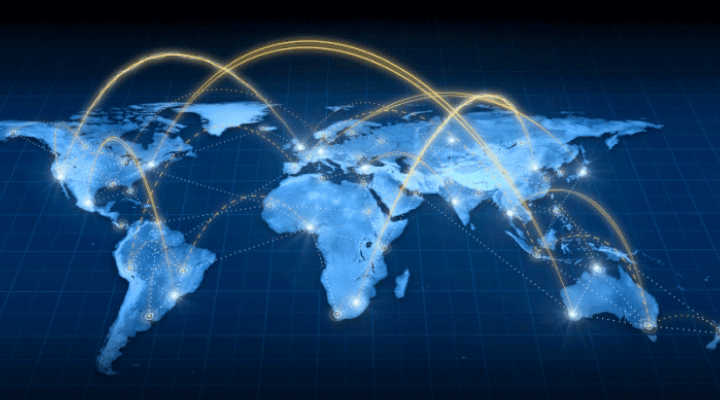 Also, many companies consider willingness to relocate – particularly abroad – an asset. And don’t overlook the U.S. government. Check out usajobs.gov, fill in your skills and desired country, and see what comes up. Usually, the U.S. government is need of its own citizens to fill positions, so you won’t have to compete against residents of the foreign country. It goes without saying, but cleared professionals need to be very careful when considering overseas companies. There are numerous global companies that conduct cleared work (under a U.S.-based subsidiary), but you need to do your homework. When in doubt about a company’s credentials or affiliations, don’t risk your clearance for a temporary (and perhaps high-paying) job OCONUS. Don’t forget about recruiters. As always, remember that a recruiter can be a great ally in your job search – whether at home or abroad. Recruiters usually have a broader network than you and can make unexpected and valuable connections. So, keep in touch with your recruiters and tap into this resource when you’re looking to shake things up with an overseas move. Navigate the language and cultural barriers. This goes along with doing your homework, but even if you’re moving to an English-speaking country, you will need to re-learn how to communicate. Some skills or personal attributes that are considered an asset in the U.S. workplace can be a negative in another country. Your independence and drive at home might be interpreted as arrogance abroad. Even if you think the country is a good fit for you, you need to study up ahead of time to make sure you are a good fit for them. Be flexible and patient. The experience of working overseas will stretch you, but the process of finding a position will stretch you too. It’s a great time to practice being flexible, since you will need that skill when you move overseas. Matching skills to a position as an outsider takes time and energy, and you have to be willing to wait patiently for others to make decisions or process paperwork. Try to enjoy your remaining time in the states while you wait for everything to line up. If things are feeling stale for you, it could be a great time to immerse yourself in another country, make new friends, and change up what your everyday life looks like. Traveling abroad can help you see things in a new and different light, which can be a real boon to your work.